Chef/owner Jude Kereama is a New Zealander who won awards for his restaurants in both London and Auckland before moving down to Cornwall to open Kota restaurant. At Kota restaurant with rooms, Jude works his culinary magic on the best local produce using his signature Asian twist. 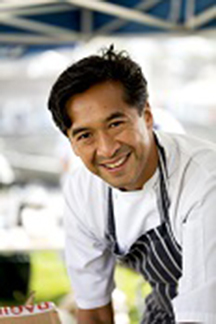 Chef Jude is half Maori, half Chinese Malay, and grew up in New Zealand, the youngest of five children. His cooking style reflects the mix of Chinese-Malay and Western food that his mother created, along with his appreciation of Cornish produce. He was introduced to working in a kitchen while at university. He was so drawn to the drama, fun and food that he chose to leave university to train as a chef. 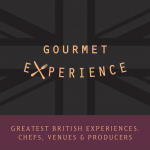 Jude moved to the UK in 1996 having trained under New Zealand celebrity chef Simon Gault. He spent many years working in top London restaurants before moving to Cornwall. Kota – which means ‘shellfish’ in Maori – is set in a 300-year-old building, right on the harbour front of the historic village of Porthleven. Kota has received the Award for Creativity and Innovation by the Trencherman’s Guide 2017. Kota is also proud to be recognised by the Good Food Guide, the Michelin Guide (with a Bib Gourmand Award), Harden’s Restaurant Guide, Square Meal and the AA (with two Rosettes). Jude also runs the sister restaurant Kota Kai. Cornish-Asian-style restaurant with 2 smart en suite B&B rooms, including 1 with harbour views. For the cherry purée, cook all the ingredients gently in a pan until soft, then puree in a blender. Next the cherry parfait, put sugar and water in a sauce pan and stir then bring to a rapid boil. Meanwhile, whisk up the egg yolks in a kitchen aid until frothy. Using a probe, bring the syrup to 120°C and while the kitchen aid is still on, pour the sugar syrup on to the egg yolks and whisk until it triples in volume and becomes cool. Whisk in the cherry puree and lemon juice. Fold in the soft peak double cream, set in moulds and freeze. For the sugar syrup, bring the ingredients to the boil then cool down to room temperature in the blast chiller. For the raspberry sorbet, mix all of the ingredients in a blender and then strain. Churn in a ice cream machine. To make the Turkish delight cream, blend all the ingredients except, for the egg and egg yolk, in a food processor until smooth. With the machine still on add the egg and yolk until combined. Spread out on a baking tray and bake for approximately 35 minutes to set and then whizz in a food processor until smooth again. Put into a 1 litre plastic container and chill to 4°C. For the sloe gin jelly with blackberries, bring water and sugar up to heat in a saucepan until the sugar has dissolved. Add the zest and juice of 1 lemon and the sloe gin, whisk in the softened gelatine leaves and mix properly. Fill moulds 1/3 of the way up and add some blackberries, leave to semi set then add more jelly mix and more blackberries on top to set. Next make the cobnut praline: Place sugar and water into a saucepan and stir, reducing and increasing the temperature to make a golden colour. When it reaches the desired colour, add the cobnuts, stirring to cover the nuts with the caramel. Spread the mixture onto a baking tray with parchment paper to cool. When cool, pulse in a blender to make a crumb consistency. For the white chocolate shards, temper white chocolate and then spread on to a chilled marble board to form shards. Spread a tablespoon of cobnut praline down the middle of the serving plate. Unmould the cherry parfait and the sloe gin blackberry jelly and place towards either side of one end of the praline strip. Next, quenelle the raspberry sorbet and the turkish delight cream and place at the other end of the praline strip. 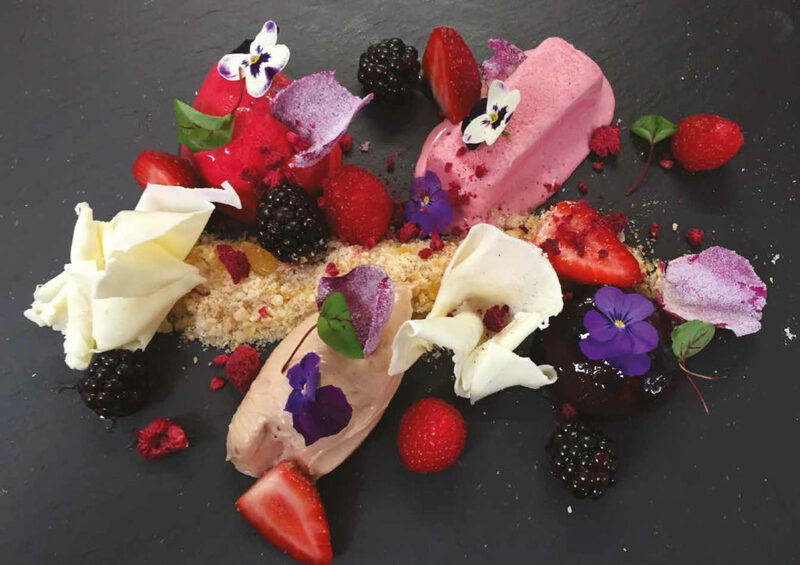 Decorate with fresh berries, dehydrated berries, sugared flower leaves, white chocolate, red vein sorrel leaves, viola flowers and nasturtium leaves.